We were taking narrow and winding back roads on a weekend road trip to southern Virginia and had decided to make a stop at George Washington’s birthplace. It was kind-of on the way and kind-of half way to our eventual destination. George Washington was born on his family’s 1300 acre tobacco plantation, in an area of Virginia now called the Northern Neck (a peninsula jutting east between Washington DC and Richmond), on February 22, 1732. They lived there until George was about three, when they moved north to another family property, which would someday become known as Mount Vernon. The house burnt down in 1779 but the property on which it stood stayed in the family until 1858, when William Lewis Washington gave the family cemetery and the area where the house had stood, to the Commonwealth of Virginia, with the stipulation that the site be recognized and protected. The Civil War happened not long after, and after the war, Virginia couldn’t afford to do a dang thing. So in 1882, Virginia gave the property to the US. And the US promptly did what everyone seems to do as soon as the words “George Washington” are spoken: constructed a granite obelisk and erected it on the site. We turned off the main road and there it was, at the entrance to the park: a 50-foot, 35 ton memorial granite obelisk, completed in 1896. 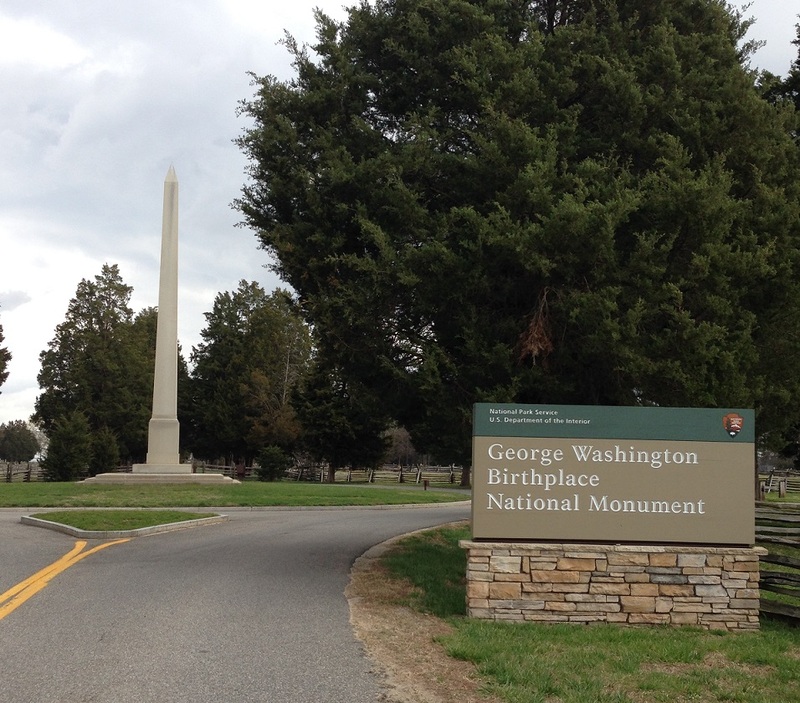 If anyone can tell me what the association is between George Washington and obelisks, I’d appreciate it. I asked a docent at Mount Vernon once (at Washington’s tomb which has, of course, an obelisk in front of it), and she gave me a story about the popularity of neoclassicism during the late 18th/early 19th century. That may be, but you don’t see obelisks popping up every time you hear “Thomas Jefferson” or “John Adams,” do you? In 1926, President Calvin Coolidge signed a law allowing the Wakefield National Memorial Association, a private nonprofit made up of wealthy society women (similar to the Mount Vernon’s Ladies Association) to build a “replica” of the birthplace house. The result was what you could expect a group of early 20th century colonial revivalists to produce: a house that may or may not bear any resemblance to a house typical of colonial Virginia, much less to Augustine Washington’s house. As befits a romanticized colonial revival building, it’s picturesque (I want four chimneys on my house) and bucolic. But even the setting isn’t quite right — there’s a shell outline of a house next to the kitchen garden, that shows the actual location of the original house. While we didn’t tour the house, we still spent over an hour wandering the property, looking at the gardens and the animals. Along with the sheep, there were oxen (named Lewis and Clark), pigs (whose names I don’t remember) and a couple of police horses who had been retired to the park. Recently, a DC area animal rescue announced the acquisition of a heritage breed piglet from a historic site. The site, the rescue said, bred animals so that tourists could see babies during the spring, then sold them for slaughter at the end of the tourist season. 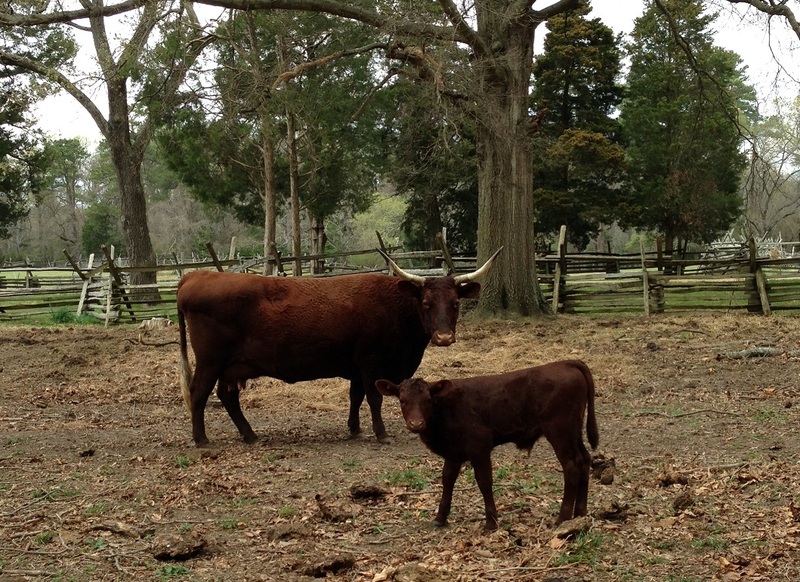 Ever since I’d heard that, I make it a point of asking about the animals I see at historic sites. 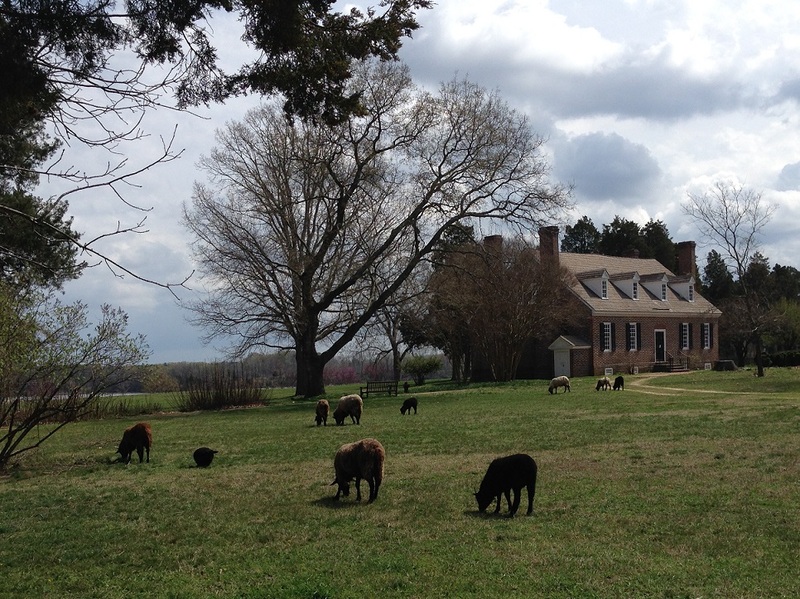 GW’s Birthplace assured me that most of their animals live out their lives on the property. The only reason they’d be sent away, said the ranger, was to populate other parks or participate in breeding programs elsewhere. They didn’t want the animals at any given park to interbreed for too many generations. When we were done with the animals, we drove about a quarter of a mile down a dirt road to the Washington family cemetery. George’s father, grandfather, and great grandfather are buried there, along with about 30 other family members. 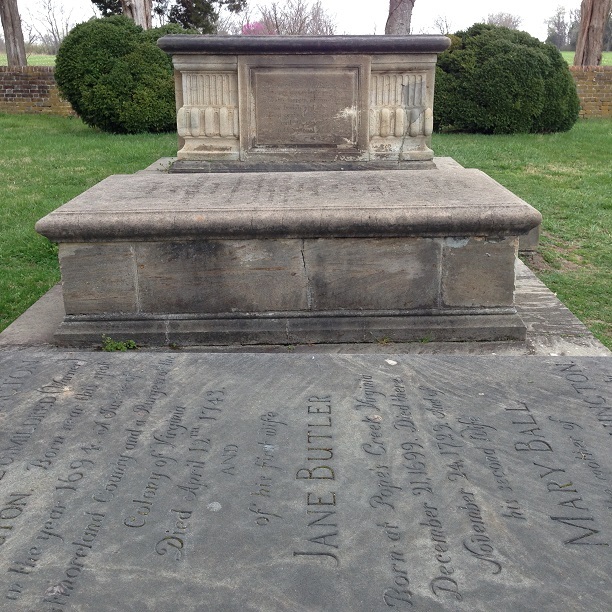 George’s father, Augustine, is buried next to his first wife, Jane Butler. I’m surprised that George’s famously cranky mother, Mary (Augustine’s second wife), allowed it. But perhaps she wasn’t as difficult as history makes out. In any case, Mary is buried at Kenmore, her daughter’s estate in nearby Fredericksburg. Gallery | This entry was posted in Virginia and tagged Augustine Washington, heritage animals, Jane Butler, Wakefield National Memorial Association. Bookmark the permalink. Good visit. I was reading yesterday that the Austrian Government are going to buy the house where Adolf Hitler was born to stop people visiting! I’m surprised Adolf Hitler’s birthplace is still around and accessible to the public. I have mixed feelings about places and objects associated with negative events and evil people. We don’t want the crazies to make a shrine of them, but it’s also a part of history and destroying them isn’t going to change that. It’s like the discussions happening in the States now, about Confederate monuments. I’d never really given the fate of animals at historic sites much thought until I heard about the piggy rescue. I naively assumed that they just lived out their lives at the site. The ranger at the George Washington site, that I questioned, said “They’re rare heritage animals, so no one would kill them arbitrarily.” But I recently saw a restaurant menu that had “heritage lamb” on it. So they might not be killed arbitrarily, but they’re certainly killed for food. And by the way, in honor of Pippa, I gave up dairy. Thought I’d never be able to live without cheese but it turns out that it’s no problem at all. And I actually feel better. I think I may have had milk allergies, or been a little lactose intolerant, because my weak lungs and bad sinuses issues have not materialized this spring. So Pippa is showering good vibes from beyond. Probably not fair to impose current historic preservation preferences to former decades, but I don’t see much point to building inaccurate repro house in a separate location and hawking it as Washington’s birthplace. How disappointing. 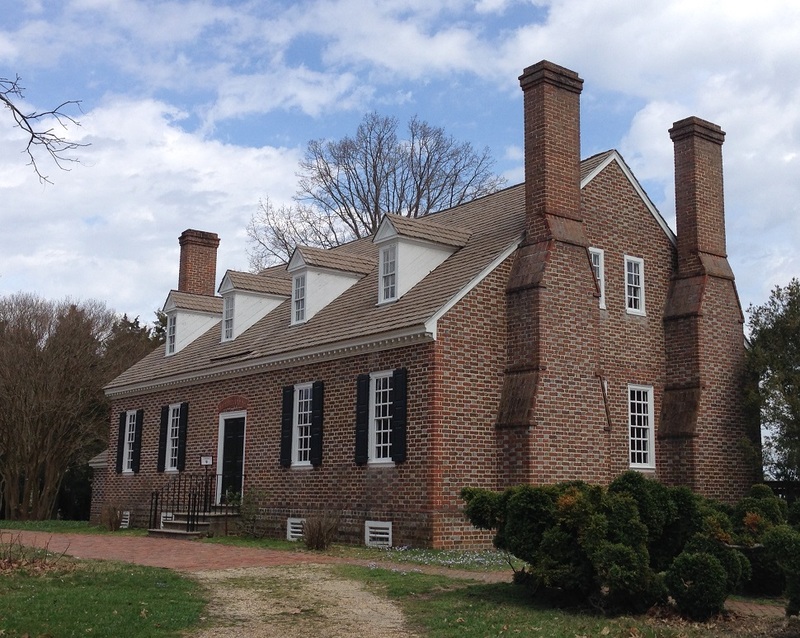 The property is called Washington’s birthplace, but they don’t make any claims about the house. They call the house “Memorial House.”.